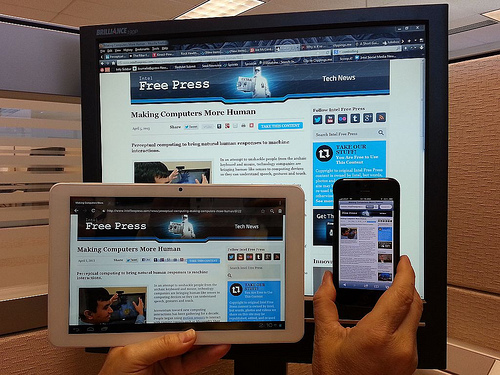 Responsive Design or Mobile Site? Which is Best For You? Responsive design allows you to see the website in its original form, but perhaps slightly modified to work best on whatever platform you use. The website adapts to your screen settings, adjusting the text if the screen flips from your phone from horizontal to vertical, and sometimes accommodates zooming in and out as well. It uses the same code as the original site meant for computer viewing, which saves time and money for developers. The downsides to using this type of design? Websites without mobile devices in mind may have painfully small text and so much information/so many links on one page that users can feel overwhelmed. Luckily, a few newer mobile devices, such as the BlackBerry 10, allow for a much improved display of responsive sites with higher resolution and larger screens. Mobile websites and mobile apps essentially give the same service. The only difference between the two: a mobile site simply requires you to go to the link in your web browser; a mobile app needs to be downloaded to your device. Mobile sites come with a design specifically made for your mobile device. Usually they’re designed particularly for smart phones, and then companies offer the same design on tablets as well. Generally, smart phone users want a different experience than somebody on a laptop or desktop computer. Desktop versions usually give you the feeling of being able to explore freely. Mobile apps and sites work around walking you through their website or through a specific process while trying to tailor it to you automatically (usually by offering options and/or finding your GPS location, depending on the company service). You generally receive a limited experience when using the mobile versions rather than desktop versions. While convenience rises, features fall. You may want to know specific information about a company, such as its address or how to contact it. Features like this often come less accessible in the mobile versions of websites. Which Approach Should Companies Take? It’s really up to the company’s service and the customers’ demands. Obviously, you could make both a responsive type and a mobile one, as long as you have the budget. This has worked for many companies. For example, The Guardian has both a responsive design and mobile designed site. The responsive design gives you essentially the desktop version of the site, and allows for easy browsing and viewing of all articles. The mobile site gives convenient lists of articles and aesthetically formatted text and photographs. So the real question, what works best for the user? It seems that the casual site user may want to stick with mobile designs when browsing a website. People who want to explore the depths of the site will want to use responsive design to have more freedom and access to the site. Take some time to explore both types and see which one suits you best. Hi Teddy, I think we should try to keep pace with the fast running world. Smartphones have taken over the world now. Knowing the extent of usability of these smartphones, you must think how far can it help your business to have a mobile responsive design. Hi Teddy, I would always prefer a mobile site over a responsive design. I would like to justify my choice here. We all know how fast is the world running nowadyas, and all business are trying to become mobile friendly in order to offer convenience to their clients. In such a situation, choosing a responsive design over a mobile site would be a mistake. Hopefully Teddy or someone else here with mobile website design experience will weigh in on this. When I first started this blog, I installed a plugin to make my site mobile compatible. Since then, I’ve been told that for a simple site (like mine) that I really didn’t need that plugin. I removed the plugin and I think the way my site displays on mobile devices is fine. It’s possible that it could be better designed and at some point, I should check out DudaMobile (which Jeannette Paladino recommends). In the future, when I redesign this site, I’ll use a responsive design. Hi Teddy, I am a big supporter of mobile websites. But when you think of an unresponsive mobile website, I am all against it. No one should make an unresponsible mobile website. Instead of helping the user, they create more problems by crashing the operating system of the mobile temporarily. As a business owner and in the internet marketing industry I think it’s more beneficial now a days to have a responsive / mobile site as more and more people have smart phones and do searching whilst on the move! Absolutely Steve….These days people are just so on the go and want the info faster than ever! For two years I used Network Solutions for mobile viewing of my site on a smart phone. I changed a few months ago to DudaMobile. It is really easy to set up, even for non-techies like me. Their phone support is excellent, and they guided me through the setup of the template I chose. I’m very happy with the design and it takes visitors to exactly the part of the website they want with a simple click. I’m getting more traffic on mobile. DudaMobile sends me stats when I publish a blog post. Thanks for the info Jeannette. I remember reading on your blog that you were happy with DudaMobile. Now that I finally got an Android, I’ll have to check out your site on it. I plan to at some point work on our website so it works in a mobile device. 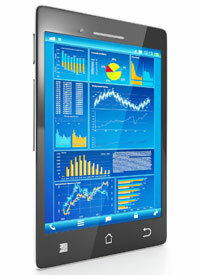 What we noticed with our competitors mobile devices is that you are not really able to see all the information. Having a very complex e-commerce site we are concerned if it is worth the time to recreate the site. Doing the blog site would be different. I think it really depends upon the site whether to see a mobile site or not. Arleen, it looks like the eCommerce site you run is built on osCommerce. You should be able to create a mobile theme and never touch your desktop theme that you have running. Or, as this article points out, you could look to build the site on a responsive theme that adjusts the content. I can show you a quick Google analytics filter that could help you establish how much lower your conversion rate is on mobile devices than on desktop. This would give you a good idea of how important a mobile design is to your site. If you’re on the reporting tab, click the advanced segments button on the top left of the page. There’s a default segment called “Mobile and Tablet Traffic.” If you click that as well as “All visits” you can compare the 2 segments everyone in your analytics account. Then, just head to your eCommerce reporting and check out the difference in conversion. My site does not have those taps. It is stripped and my web developer has not updated anything from OScommerce. When my site first used this program it was 8 years ago and mobile and tablets were not popular. The only things under the reports tab is Products, Order Totals and NJ Sales Tax. Wow! It’s great to see this conversation between you and Dave. I’m glad Teddy’s post fostered this discussion. Thanks for sharing that info about 4G coming to the UK this year. That’s exciting. Almost 30% of my daily traffic is visiting my blog from a mobile device and tablets. Because of this reason, I have created a responsive mobile theme for my WP blog and now I am noticing that the bounce rate of visitors visiting my blog from mobiles has increased. Everybody should bear in mind these important factors in mind before creating a new blog. That’s an impressive amount of traffic from mobile devices and tablets. You’ve seen an increase in your bounce rate from mobile visitors since using a responsive theme? Hey all, thought I’d weigh in on this topic. As Teddy writes, the debate is a little bit more about what works for the specific project or site. I just thought I’d list a couple of the key features I consider between the 2. Responsive: Responsive is a little bit of a relative term. At each point on the site where the code responds and restructures the content is called a break point. There’s also typically image resizing & masking to make the images fit any dimension. Depending on the quality of the responsive design and the number of breakpoints, image resizing, and image masking, the effectiveness of the design will vary. Responsive is definitely better for SEO (no duplicate URLs). However, responsive designs are also considerably “heavier” and can increase page load times significantly for big sites. Part of this is because the site is loading large images, even if its served on a small device. Mobile: Mobile only designs are less complicated (and cheaper) to produce. However, sometimes this simplicity means that you think out the mobile design a little better than responsive and really tailor it to the device. A side benefit of mobile is you can have a link to the full site and by-pass any annoying treatment of the content. The site is a little lighter and will load faster (considerably so depending on a whole bunch of factors). It does suffer from the SEO issue of multiple URLs and doesn’t necessarily accommodate every screen. One tip I can give is if you’re looking at a responsive template for your site. Make sure you resize it and look at how the content is treated at each stage of the template. Thanks so much for your well thought out comment! I really appreciate the additional insight. Teddy hasn’t been around this week to reply to comments and website design for mobile computers is not my strong suit. What Dave mentions here is important. Thank you for weighing in on your expertise Dave. This is definitely added value to the discussion. And you’re absolutely spot on when it comes to the differences, advantages/disadvantages of mobile sites and responsive web designs. I apologize for missing out on this conversation earlier. So thank you for pinch hitting for me. Well I’m posting this comment from my blackberry mobile phone, though lower than blackberry 10 (9900) and everything is ok, this blog is also using a responsive design. I’m may not be on the side of those that supports mobile view but I actually prefer responsive designs and the disadvantages are low (that’s if they have disadvntages). Some mobile views if not all, does not show graphic at all, I might find reading that blog so boring, that’s if I’m a new visitor but with responsive design, you’ll still maintain your graphics and theme in a responsive way. Though mobile sites are readable but responsive designs are user friendly. Thanks for letting me know Gilbert. I’m still using an older version of Thesis but since this site isn’t very complicated, it seems to handle it well. I appreciate your feedback on designs. Teddy (the author of this post) hasn’t been around this week to reply to comments. So, I appreciate it when someone like you adds additional info to the conversation. Thanks for taking the time to join the conversation Pramod. I appreciate it. I thought and I am not a developer that responsive design was the way to go especially as it works or so I am told on tablets. At least you can look at your analytics to see if there are a high number of visitors via mobile to see if you need that design. Susan, That’s a good point about checking your analytics to see how many visitors are using mobile technology. Thanks for reminding us of that. Personally, I am not but the business I am promoting however is active on it. Thank you for replying to my post by the way. I will continue to follow you blog. For more tips and info. Thanks. Responsive website design does seem to be the trend right now Susan. Thanks for taking the time to weigh in on this. Have a great weekend. When designing for Wordpress for my customers (which tend to be small business to business or service related small businesses) I personally like the idea of responsive design but then also having a mobile site with a view full site link. This gives the ability to simplify a site to offer what the casual mobile user wants but having a full site that is still optimized for a mobile platform. It’s good to see you here! I think the idea of having a separate mobile site is great (for those who have the resources). Talking about mobile sites. . . I still own the “mobi” version of a domain that I have. (I also own com and net.) Do you know if people still build sites with the mobi domain and then have visitors automatically directed over based on their device? I’d be interested in your thoughts as well as from any other reader here. Thanks! I think it really depends on your target audience and the code you plan to use to redirect. Some of the codes I have seen will redirect to a sub domain and some will entirely let you pic a different site. I have been looking into the redirect CloudFlare offers because it is a service I recommend to my customers to help the performance of their site already and CloudFlare uses the subfolder redirect. Thanks Matt. I’ve used CloudFlare before (with varying results). I’ll check that out when I get a chance. I hope all is well with you. Everything is going well, I started my new blog to help small businesses and play with wordpress technology and plugins before I recommend them to customers. I think wordpress does a good job on making site more mobile friendly with responsive ready themes but sometimes a customer needs a more specific site for the mobile user, if you have had success with any other companies that offer code to determine mobile vs full site let me know and I will test it out. Thanks for sharing this. Personally I think readers (including me) prefer mobile view. I mean responsive design is okay but..mobile view for better layout? Thanks for adding your two cents Reginald. Building two sites is probably the ideal solution. I found this to be true because of the way our website was designed. Not only that but it take ages to load, so i decided to go for responsive design. Now that i have many mobile users im trying out a mobile version too. Who here has experienced what i went though ? I don’t have any experience personally designing mobile websites. Are you active on LinkedIn? There are some great support groups there. This is almost a Catch22 question. Read today in the papers that sales of laptops are going down, stationary computers are more or less the same and people are buying more and more tablets and smart phones. After reading the article Responsive Design appeals to me. Shakaib, which Jetpack plugin do you use? There are an abundance of them and I couldn’t figure out which one you were refrerring to. Have a feeling you have two Jetpack plugins? Catarina recently posted..Is Soros right – Could the Euro crisis destroy the European Union? I hope Shakaib sees your question. I was unaware that the Jetpack plugin offered that feature. To my mind, to say which one is the best is quite impossible, each of them could be the best depending on the certain project, its goals, target group, etc. Furthermore, what is the best for a developer or a website’s owner doesn’t always mean it’s the best for the users. If you think to go mobile first of all you should think about a mobile strategy and what path is the best for it. I think we’re all in agreement that there is no one size fits all solution for website design. It does come down to what’s best for our customers. Sometimes website owners design for themselves that’s for sure. I’ve had conversations with several people who make basic mistakes (like white text on colored backgrounds) because they like the way it looks. If they really wanted to know what their customers preferred they could at the very least ask them or better yet, test it. BTW – You have some great examples of demo sites using Flash. I’m surprised that there’s still a demand for them but it does fill a need. Sherryl Perry recently posted..Responsive Design or Mobile Site? Which is Best For You? I didn’t realize that the Jetpack WP plugin has that feature. Thanks for sharing that information with us. Yes shakaib is right, i am also using jetpack mobile theme option and its working fine. Here is official jetpack link for responsive theme: jetpack.me/support/mobile-theme/, I think instead of using different plugins and making a blog slow, jetpack is all in one plugin to perform different tasks. Are the WordPress blogs that you have the JetPack plugins installed on self-hosted? Yes, my blog is self hosted and running on a vps server. I am talking about TLDs. is jetpack not available on free hosted wordpress blog? Thanks for the quick reply Maddy. The reason I asked is because JetPack was originally developed for WordPress.com and then it was made available to self-hosted sites. I manage one client site that I migrated from wordpress.com and it has JetPack installed but I’ve never been a real fan of it. I appreciate your feedback on it. I’m glad that it’s working for both you and Shakaib. That could be helpful for other readers. Thanks Sherryl I am happy that my experience is helping others. I just analyzed Jetpack in depth, because its pre-installed in self hosted Wordpress blog. I just analyzed it because i considered it important, because of its pre-installation. It has many other options like share buttons. Just to clarify for the other readers here, I believe that JetPack is automatically installed on WordPress.com blogs but I don’t believe it is part of the core installation. Thanks again for your contributions to this post. I appreciate a lively conversation. Yes its not part of a self hosted Wordpress blog’s core installation, but if you are installing your Wordpress blog’s script via scripts available in cpanel then you will get pre-installed Jetpack, aksimat, hello dolly and WP super cache in it. I am developing and running Wordpress blogs from past 3 years, that’s why have good experience about it.